Definition at line 55 of file signal.h. Definition at line 16 of file signal.h. Definition at line 20 of file signal.h. Definition at line 51 of file signal.h. Definition at line 47 of file signal.h. Definition at line 52 of file signal.h. Definition at line 49 of file signal.h. Definition at line 48 of file signal.h. Definition at line 50 of file signal.h. Definition at line 28 of file signal.h. Definition at line 41 of file signal.h. Definition at line 43 of file signal.h. Definition at line 40 of file signal.h. Definition at line 32 of file signal.h. Definition at line 29 of file signal.h. Definition at line 30 of file signal.h. Definition at line 22 of file signal.h. Definition at line 25 of file signal.h. Definition at line 23 of file signal.h. Definition at line 27 of file signal.h. Definition at line 31 of file signal.h. Definition at line 35 of file signal.h. Definition at line 24 of file signal.h. Definition at line 33 of file signal.h. Definition at line 34 of file signal.h. Definition at line 39 of file signal.h. Definition at line 26 of file signal.h. Definition at line 45 of file signal.h. Definition at line 17 of file signal.h. Definition at line 6 of file xcptinfo.c. 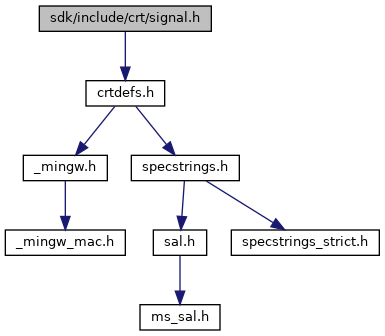 Referenced by sighandler(), and test___pxcptinfoptrs(). Definition at line 71 of file signal.c. 88 //FIXME: set last err? Definition at line 23 of file signal.c. Referenced by raise(), test___pxcptinfoptrs(), and test_signal().